You will never believe what happened at the party yesterday! Ellen kissed Ruben and Peter…. Suppose this is the last thing you read in your friend’s e­mail before your computer breaks down. If you have some prior knowledge regarding the situation described, you would be able to guess how the interrupted sentence could continue without great difficulty. For example, if you know that Ellen was secretly in love with both Peter and Ruben and you know she has a certain reputation, she may have kissed them both, but if you know she has a crush on Ruben, but definitely not on Peter, the remaining part of the sentence would more likely be something like (Ellen kissed Ruben and Peter) smiled his approval from a distance. The main question of the research presented in this dissertation is whether readers’ knowledge of a situation immediately affects the structural analysis (i.e. parse) of a sentence. This knowledge is called situational knowledge and is provided by means of discourse context. Syntactic ambiguity, specifically, the NP­/S­coordination ambiguity is used as a research tool. Results of a series of off­line experiments, self­paced reading experiments and an eye movement experiment are discussed. The results support the idea that the parsing process is immediately affected by situational knowledge, a non­syntactic factor that is often even considered non­linguistic. 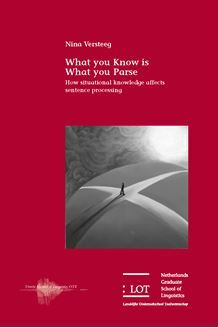 Consequently, parsing is argued to be a highly interactive, dynamic process that changes in response to the strength of various sources of information. This dissertation should be of interest to those interested in sentence processing and its interfaces with discourse representation.